Beyond Slacktivism examines how routine social media use shapes political participation. Many commentators have argued that activism has been compromised by “slacktivism,” a pejorative term that refers to supposedly inauthentic, low-threshold forms of engagement online. Dennis argues that this critique has an overly narrow focus. He offers a novel theoretical framework—the continuum of participation—to help illuminate how and why citizens use social networking sites to consume news, discuss civic matters, and engage in politics. This idea is explored in two interrelated settings. Firstly, in an activist context, through an ethnography of the campaigning organisation 38 Degrees. Secondly, within day-to-day life, by combining evidence of behaviour online with reflective diaries. Drawing on this rich data on individual-level attitudes and behaviours, Dennis challenges slacktivism as a judgement on contemporary political action. 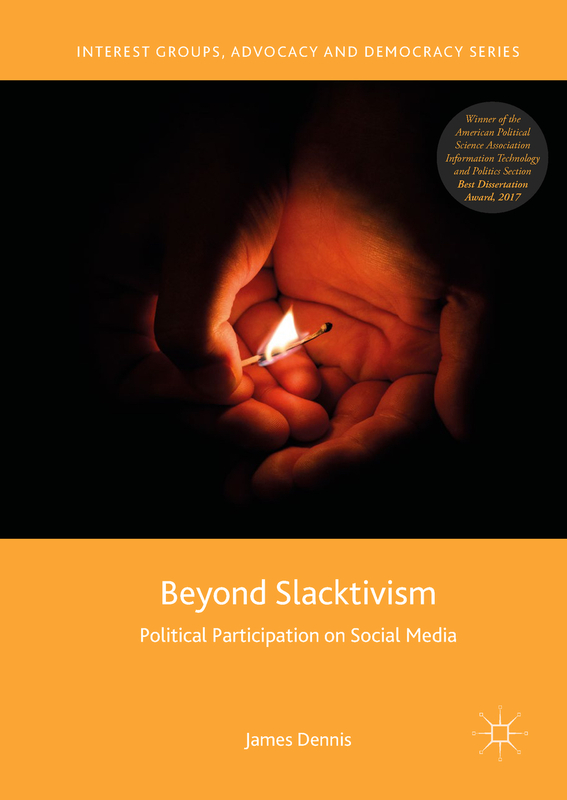 Beyond Slacktivism provides an account of how the seemingly mundane everyday use of social media can be beneficial to democracy. For those researching slacktivism and online political engagement, you can download the bibliography for free from SpringerLink.